I'm back with another Christmas card. I just love how this one turned out. This image is from Wags 'n Whiskers and is called Zoe & Gemma Snow Fun. Wags 'n Whiskers very 1st challenge started today. The theme of the challenge is MAKE 'EM SPARKLE. Just make your cards/projects sparkle and make sure you use a Wags 'n Whiskers stamp. The "sparkle" that I used was the 3 purple gemstones on the right side of my card and the 1 purple gemstone in the middle of the snowflakes on the left side of the card. I also added Frosted Lace Stickles to both hats, the snowflakes, the snowmans buttons and to the snow at their feet. There is also a glittery effect to the ribbon that I used on the card. (It's kinda hard to see in this picture). Susie's Sassy Challenge began their very 1st challenge yesterday. The theme for their very 1st challenge is CHRISTMAS. My color scheme came from the challenge over at Lily-Boo Too Challenge Blog. This month's theme is the color PURPLE. This weeks challenge at Creative Card Crew was to use Ribbon and Gems on your project. The ribbon I used is called Offray Kendra White/Opal and the gemstones are purple. 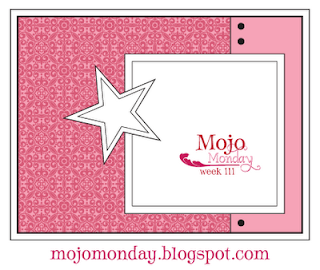 The sketch that I used for my card is this weeks challenge over at Mojo Monday. When I saw this sketch I knew that I needed to use it to make a Christmas card. It's a simple sketch, yet you can add to it in so many ways. I will definately be using this sketch again. this is lovely and in my favourite colour too, great job! Lovely colour scheme, very frosty. Love the sparkle on your card. Thanks for playing along at CCC this week. This is a sweet image and coloured very nicely, lovely card. Thanks for joining Susie's sassy Challenge, good luck. Hi ya darlin, super card! wonderful image. Thank you for joining us over at Susies sassy challenges. We hope to see you again next week! 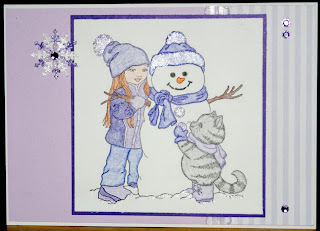 a lovely card , that image is gorgeous i just adore snowmen ! thanks for joining us at lily-boo too . You're invited to come get your FREE digis and enter our HUGE prize drawing today! Such a pretty card and I love the sparkle. Thanks for joining us this month at LBT. oh, Mary, this is so adorable, fab coloring and love the shimmer! Beautiful card! Thanks for joining us for Susie's Sassy Challenge. Hi there Mary..oohh I'm really into lilacs and purples too at the moment. Very cute image! Thanks for entering your card into Susie's Sassy challenge! Fantastic card, Mary!! I love all of your sparkly accents. Thank you so much for playing along with the Wags 'n Whiskers very first challenge!! Great card cute image. Well done on combining so many challenges not always an easy task. Sparkles, color, charm!! I love it. From time to time, I dabble at card making and enjoy. As you know, the opportunities are endless. Nicely done!